This summer the USMNT will be left out of the most-watched sporting event in the world. The football vs futbol and World Cup vs Super Bowl debates are made in vain. 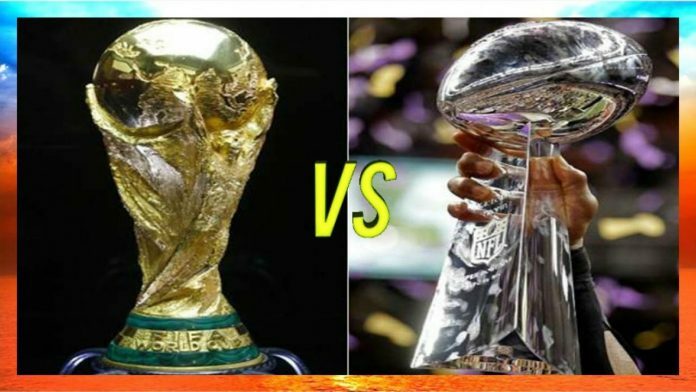 Although the NFL and the Super Bowl continue to hold the top ratings spot in the U.S., overall World Cup viewership dwarfs that of American football. During the 2014 World Cup final in Brazil, more than one billion people tuned in to see Germany knock off Argentina. Of those viewers, 695 million watched at least 20 consecutive minutes. By comparison, the most-watched Super Bowl was the 2015 match up between the New England Patriots and Seattle Seahawks. That game drew 114.4 million viewers in the U.S., and an estimated 30-50 million internationally. The most recent Super Bowl between the Patriots and the Philadelphia Eagles was the least-watched Super Bowl since 2009. Its 103.4 million viewers in the U.S. was slightly below the 105 million Americans who watched 20 minutes of at least one game from the 2014 World Cup. 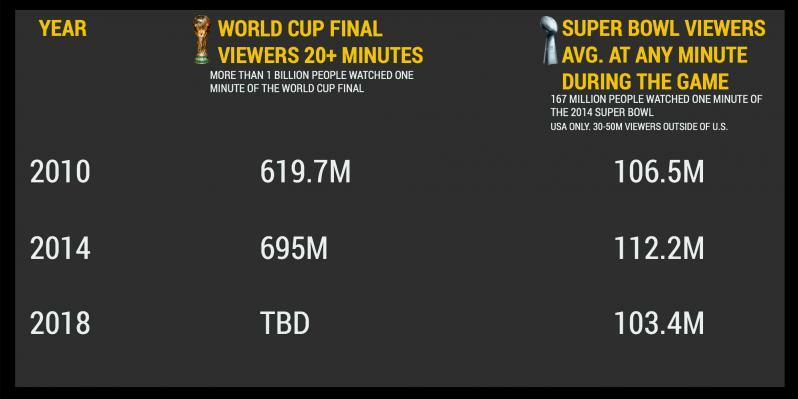 The massive viewership numbers of the World Cup and Super Bowl pad the coffers of FIFA and the NFL respectively. FIFA has turned a profit of close to $5 billion from the last two World Cups combined. The TV rights for the 2014 World Cup ($2.43 billion) exceeded all of FIFA’s expenditures ($2.22 billion) for the tournament in Brazil. The Super Bowl accounts for an estimated $620 million of the NFL’s revenue. That number helps make the NFL the leading revenue generator among all professional sports leagues, having surpassed $14 billion during the 2017 season. 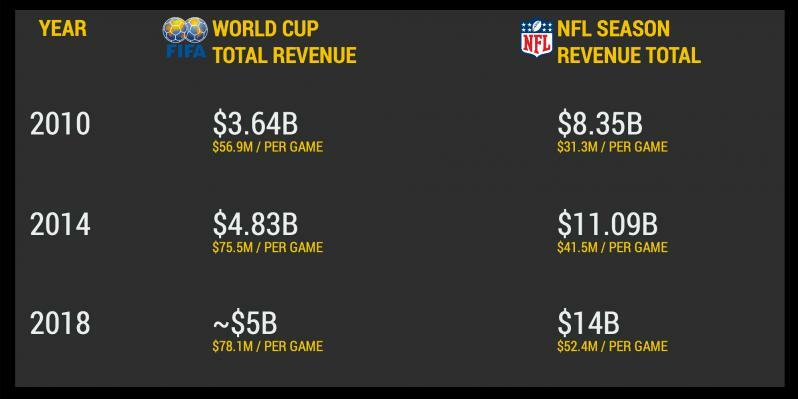 Although the World Cup lasts just a month and features 64 games, its 2018 revenue will likely eclipse $5 billion. So, where does the money go? Germany’s national team received $35 million from FIFA in exchange for winning the World Cup in 2014. That $35 million was considered a cost for FIFA, so it did not come out of its $2.6 billion profit from the tournament. Each of the 23 German players on the roster received $408,000 for winning. That means that the German Football Association kept $25 million of FIFA’s money to allocate beyond paying its players. The World Cup winners’ haul looks handsome compared to the $112,000 each member of the Eagles’ Super Bowl-winning team received from the NFL. Patriots players took in half of that sum at $56,000 apiece. Each NFL team has a 53-man roster, but a few extra players earn that bonus by being on the roster for at least half of a team’s games.